Hubbs, Clark & W. H. Brown. 1957. 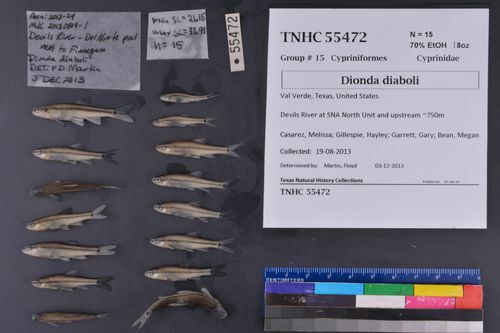 Dionda diatoli (Cyprinidae), a new minnow from Texas. Southwestern Naturalist 1(2): 69-77. U. S. Fish and Wildlife Service, 1999: Endangered and Threatened Wildlife and Plants; Final Rule To List the Devils River Minnow as Threatened. Federal Register, vol. 64, no. 202. 56596-56609.